The aims of the International Society for the Study of Behavioral Addictions (ISSBA) are to study behavioral addictions and to help developing the interface of behavioral addiction science on the international stage. The aim of the society is to assemble and stand for specialists working in the field of health promotion, prevention and treatment programs for patients with behavioral addictions, rehabilitations, harm reduction measures, psychiatrists, addiction scientists, psychologists, social workers, addiction consultants, specialized nurses, volunteers and other professionals under an organizational order. The aim of the society is to offer effective educational and training programs for professionals in the field of behavioral addictions in order to improve their skills and knowledge about prevention, intervention, therapy, and nursing about behavioral addiction. The aim of the society is to encourage scientific research projects, offer professional support in design and implementation of upcoming research projects. With those results the society seeks to understand better the problems of non-substance addictions and to decrease their prevalence in the population. The society supports to publish and present the results of addiction science research projects in order to enrich the academic discourse about the behavioral addictions and also all in the public domain. The society is dedicated in the educational programs of the population, such as supporting and organizing educational, prevention, and treatment programs in school environments. The highlighted aim of the society is to work with and help other non-governmental organizations in order to recognize the symptoms of the behavioral addictions and hold on the expansion of the behavioral addictions in the population. The aim of society is to co-operate with non-governmental organizations, professional organizations, academic departments, and voluntary groups in order to find the most effective solutions on the problem of behavioral addictions. If you want to verify your registration data, please, click on the button below. Title* Dr. Prof. Ms. Mr. Mrs.
We are happy to announce that the Journal of Behavioral Addictions (JBA) has a new impact factor of 4.134 as listed under the 2016 impact factors that were just released by Thomas Reuters. 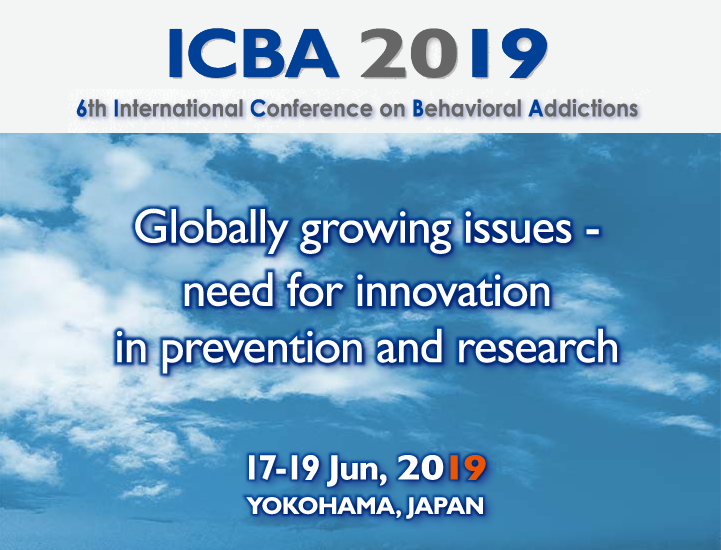 The next International Conference on Behavioral Addictions (ICBA) will take place in Yokohama, Japan on June 17-19, 2019. Please visit the website at http://icba2019.may-pro.net/ for registration, details, and abstract submission.